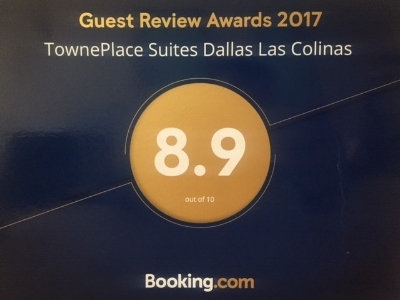 Discover authentic Texas hospitality at TownePlace Suites Dallas Las Colinas. Located minutes from top corporations including Microsoft, Nokia, NEC, Verizon, Abbott Labs, and Cognizant, our Irving Convention Center hotel offers amenities to make extended stays more comfortable. Venture to nearby attractions including beautiful Mandalay Canal Walk and an array of shops and restaurants just minutes away. When it comes time to wind down, retire to spacious studio, one- and two-bedroom suites boasting free high-speed Wi-Fi and sleek fully equipped kitchens. Stop by our complimentary breakfast buffet each morning for hearty favorites and healthy alternatives. We encourage you to get your adrenaline pumping in our fitness center, featuring plenty of free weights and cardio machines, then cool down in our peaceful outdoor pool afterward. Whether you're traveling for business or are on a family vacation, we offer a small event venue for use. Book your stay today and discover what sets our hotel apart! For Sales Inquiries Contact: Michelle Fuentes, Director of Sales at 972-550-7796.